Citizen Watches	There are 59 products. 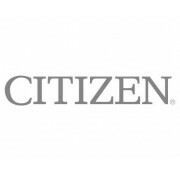 Official Stockists of Citizen Watches in the UK. Shop for the latest Citizen Eco Drive watches at Macintyres of Edinburgh and save up to 30% off RRP. 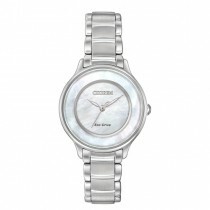 Citizen ladies stainless steel watch - Eco-Drive - White dial - White luminous hands - Date display - 26mm stainless steel case - Mineral crystal glass - Stainless steel strap - 100 meters water resistant - 5 year Manufacturer&apos;s Guarantee (covers material and manufacturing defects) - Citizen Presentation Box. Citizen ladies Eco-Drive rose gold plated and stainless steel watch - Eco-Drive - Mother of Pearl dial - Date - 2 hands - 26mm rose gold plated case - Mineral crystal glass - Rose and stainless steel bracelet - 100 meters water resistant - 5 year Manufacturers Guarantee (covers material and manufacturing defect) - Citizen Presentation Box. 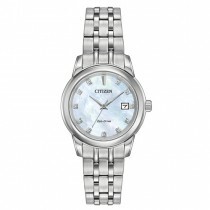 Citizen ladies Eco-Drive stainless steel diamond set bezel and dial watch - Eco-Drive - Silver dial - 3 hands - Date - 30 diamonds set into the dial and bezel - 30mm case - Stainless steel - Mineral glass - 100 meters water resistant - 5 year Manufacturers Guarantee (covers material and manufacturing defect) - Citizen Presentation Box. Gents stainless steel with gold plate detailed watch - Blue dial - Rotating bezel - Date- 200 meter water resistant - Supplied with a Citizen UK 5 year guarantee (covers material and manufacturing defects) and a Citizen presentation box. Gents Eco drive rubber strap promaster professional diving watch - ISO-certified - Stainless steel case - Blue dial - Blue rubber strap - Luminous - Rotating bezel - Eco drive - 200 meter water resistant - Supplied with a Citizen UK 5 year guarantee (covers material and manufacturing defects) and a Citizen presentation box. Citizen gents gold plated and stainless steel watch - Eco-Drive - Black dial - 2 hands - 38mm case - Gold plated and stainless steel - Thin case 4.7mm - Splash proof - Sapphire crystal glass - 5 year Manufacturers Guarantee (covers material and manufacturing defect) - Citizen Presentation Box. Citizen ladies Eco-Drive gold plated stainless steel expanding watch - Eco-Drive - White dial - Day - Date - 3 Hands - 25mm gold plated stainless steel case - Gold plated stainless steel expansion bracelet - Mineral crystal glass - Splash proof - 5 year Manufacturers Guarantee (covers material and manufacturing defect) - Citizen Presentation Box. 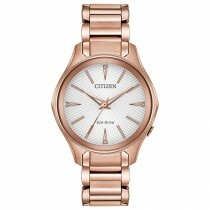 A ladies Citizen Eco-Drive rose gold tone watch from Citizen&apos;s Silhouette Crystal collection. Rose gold tone bracelet and case with a Swarovski® crystal encrusted bezel. A white dial with rose gold tone accents and three subdials accentuate the look. Citizen ladies Eco-Drive rose gold plated and stainless steel watch - Eco-Drive - Mother of pearl dial - 2 hands - 32mm case - Spherical crystal glass - Yellow gold plated and stainless steel bracelet and case - 50 meters water resistant - 5 year Manufacturers Guarantee (covers material and manufacturing defect) - Citizen Presentation Box. Citizen ladies Eco-Drive gold plated and stainless steel watch - Eco-Drive - White dial - 3 hands - Date - 32mm case - Gold plated and Stainless steel - Mineral crystal glass - Splash proof - 5 year Manufacturers Guarantee (covers material and manufacturing defect) - Citizen Presentation Box. Citizen ladies Eco-Drive rose gold plated stainless steel watch - Eco-Drive - Black dial - 3 hands - Date - 29mm case - Rose gold plated stainless steel - Mineral crystal glass - 50 meters water resistant - 5 year Manufacturers Guarantee (covers material and manufacturing defect) - Citizen Presentation Box. Citizen gents Eco-Drive thin stainless steel watch - Eco-Drive - White dial - 2 hands - 39mm case - Stainless steel - Thin case 4.5mm - Sapphire Crystal glass - Splash proof - 5 year Manufacturers Guarantee (covers material and manufacturing defect) - Citizen Presentation Box. 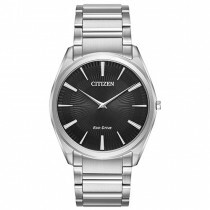 Citizen gents stainless steel watch - Eco-Drive - Black dial - 2 hands - 38mm case - Stainless steel - Thin case 4.7mm - Splash proof - Sapphire crystal glass - 5 year Manufacturers Guarantee (covers material and manufacturing defect) - Citizen Presentation Box. An elegant stainless steel diamond set Eco-Drive watch - Mother of Pearl dial - Date - Diamond dot dial - Second hand - Case size 28mm - Mineral Crystal glass - 100 meters water resistant - 5 year Manufacturers Guarantee - Citizen Presentation Box.